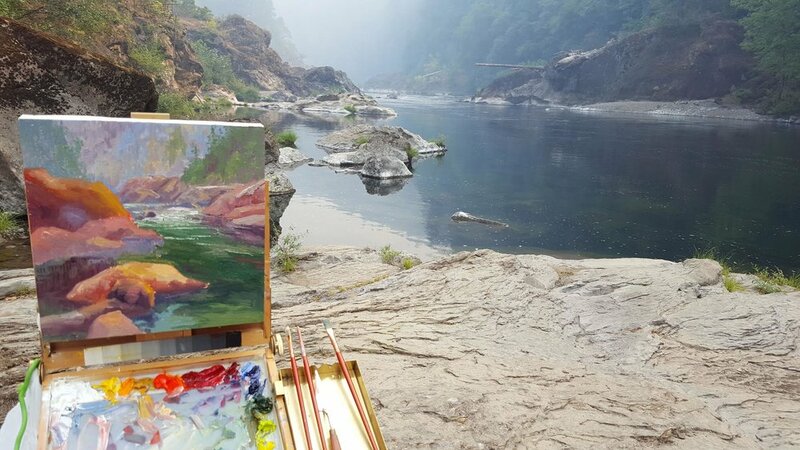 In Mid-September 2017, roughly 40 artists gathered in central Oregon for the Umpaqua En Plein Air competition. For four days, the artists learned from lectures on various painting techniques, mingled with fellow artists, and painted the spectacular wilderness. Immersed in this creative environment, each artist painted the area surrounding the Umpaqua river in his or her own unique style and vision. Among these participants was UGallery's artist of the week, Karen E. Lewis. 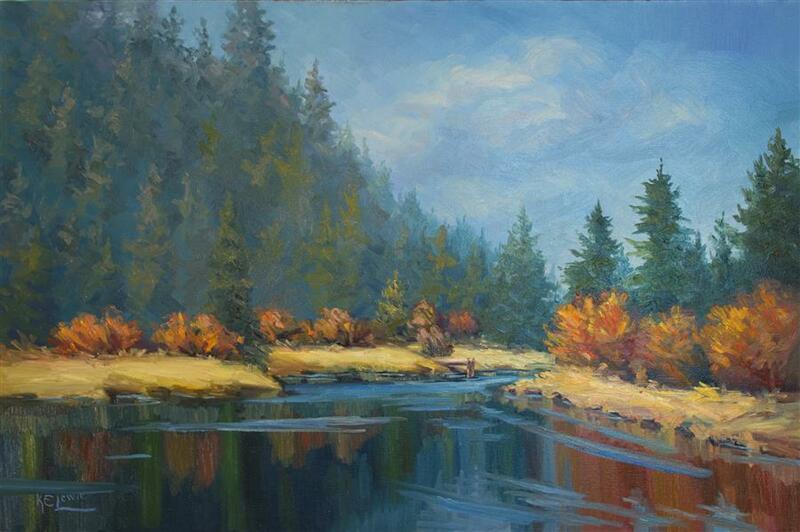 Karen E. Lewis is an oil painted based in West Linn, Oregon who specializes in impressionistic landscapes painted en plein air. To the competition, Karen brought a style of painting that combines dreamlike impressionism, untrammeled color choices, and an eye for glorious, rock-framed composition. "It is really fun to paint alongside other artists, and to see the vastly different paintings they create, often looking at the same scenery," says Karen. Karen's attention to many, changing perspectives and interpretations is at the heart of the impressionism style and her underlying inspirations. "I like the element of movement that goes into paintings of water and air," says the artist. "I have spent a lot of my life in and around water, and sitting by a beautiful river fills my heart with gladness." This emphasis on movement, particularly with respect to water and sky, is apparent in the subject matter to which she is drawn throughout her portfolio. She pursues the many moods and movements of nature. One can imagine Karen seeking the spaces between rock faces where the light radiates in a sizzling yellow and the clouds swirl in impassioned patterns. Though Karen currently works in oil paint, her fluid expressive style is a relic of her earliest medium, watercolor. She describes the shift to oil painting as luxurious, where she can delight in taking her time and adding thick layers of paint. This medium translates seamlessly into out-of-doors and on site painting. The freedom of her materials allows her to harmonize with nature, for example, in her words, "move my brush with the movement of the water." While working at the Umpaqua competition, she created four paintings in three days. "By the Umpqua River, the weather was particularly balmy that weekend. I could feel a slight breeze off the water, and at most of the locations there was the rushing sound of whitewater,” she describes. “It's the beginning of fall in the mountains. The leaves have started to turn, and there's a particular moist aroma that comes off the duff in the forest. I try to warm up the colors just a little, giving a feel of the weather." Karen's sensitivity to her surroundings and poetic reflectiveness is apparent in every nuance of her paintings. No matter the setting, whether in competition or otherwise, Karen creates artwork that honors nature's many changes. See Karen's full portfolio on UGallery.